Hello everybody! First a quick thank you for all the sweet notes from you yesterday on the anniversary of Sammy becoming an Angel. It was a sad day around here but our hearts were full of all the love and memories you shared with us of our guy. As for today’s selfie – well – we always join this Hop because it’s FUN, and our friends The Cat On My Head host it and it’s cool to join in and visit everybody who participates! Would you like to join in too? It’s EASY PEASY – just click on their badge above and you’ll be there in a second – LINK up and that’s it! Today’s Selfie is one that Mom did NOT do any Lunapic art effects with – we thought it was pretty funny just the way it is. One of those “laser eye” shots – Mom saw me curled up on a chair in the guest room and of course I gave her the “FIRE EYES” effect which is better than anything Lunapic could do! Happy Sunday! See you tomorrow for the PRE-TEASER Monday! First up – Thankful Thursday which is hosted by my buddy Brian – if you click his BADGE you can visit his blog, and use his LINKY tool to hook up your “Thankful” post to the Hop. We share all our thankfuls every Thursday. After such a tough and sad week with the tragedy in Las Vegas all I can say is that I know everyone there was THANKFUL that there were so many concert attendees as well as First Responders who helped EVERYONE who needed it……..we are so sad for those who were killed and those who were wounded. It breaks our hearts………….truly. On a lighter note, my Angel brother Sammy didn’t let me down this week – last night he transmitted via his trusty computer which he took with him to the Rainbow Bridge when he left in December – his weekly THOROUGHLY POETIC THURSDAY poem and post…………..and HERE it is!! Greetings from the Rainbow Bridge my friends……..
We’re working our way down (up?) the alphabet to the end – this week we’re all writing poems about ANYTHING that starts with the letter “Q”………….I did give you some prompts if you needed them to help get your creativity jump-started last week……….these were the prompts which you could use if you needed to! If you wrote a poem this week, you can put your blog link in the comments here and we’ll follow the link and read your MASTERPIECE or you can even just type your poem in our comments and we’ll read it here! I hope you wrote something though – if I can write poetry my friends, YOU can write poetry. Give it a try – you might surprise yourself!!!! We Angels visit – into your beds we creep! We’re quiet and careful not to wake you up! We won’t knock over the clock or your water cup! Even though you’re asleep, we can see your smile…. We cannot stay, we must all be quick….. But on your hand or your cheek we might give a lick! To be with you on your journey for your FINAL SLEEP…………. We Angels will be with you – our beloved humans – when your turn comes……it’s what we do……it’s our turn to take care of YOU like you took care of us when we were with you. Now if that’s not TRUE LOVE, what is???? Next week we will be celebrating the letter “R” and I’ll give you four prompt words to help you get your imagination going and thinking of what YOU will write about next Thursday! Ready? Maybe those will give you some ideas………..you can write about ANYTHING that starts with an “R” though………use your imagination – we animals have good imaginations !!!! I hope you have a great week and I’ll look forward to reading your poetry next Thursday! Give it a try – you might just have FUN writing a poem!! Thanks dear brother……………..I know you’ll inspire at least a couple of our friends to give writing a poem for Thoroughly Poetic Thursday a whirl next week! Meanwhile, thanks to everybody for stopping by today…………we hope you have a THANKFUL and POETIC day today! Interesting photo huh? Looks like a square cat shoved inside a square box fitting perfectly “square” inside. 😀 I kind of tricked Mom. I was nice and cozy in her studio under my favorite afghan up on the couch…..then just as she got ready to snap the picture I ducked my head behind the dark pillow. Sneaky aren’t I?? I hope your Father’s Day was as nice as ours was. The weather was PURRFECT, Dad’s presents were PURRFECT (he loved his new shirts from ME), amd our grilled/smoked chicken dinner outside on the deck was PURRFECT. After Dad got the chicken cooked on the grill, my parents stayed outside and I got under the umbrella table and Mom gave me a couple little chunks of chicken to nibble. I’m not a big chicken fan, but I wanted to join in the fun my parents were having – besides I have to admit, the chicken smelled fabulous after Daddy smoked it with apple chips on the charcoal grill. Mom says Daddy is a “Grillmeister” – whatever that is. I think Daddy had a great day. What did you do to celebrate the day – and if you didn’t have a Father’s Day celebration, what did you do for your Sunday activity? Don’t forget tomorrow is Teaser Tuesday. I’m working on it. I promise not to make it too tough (tee hee). 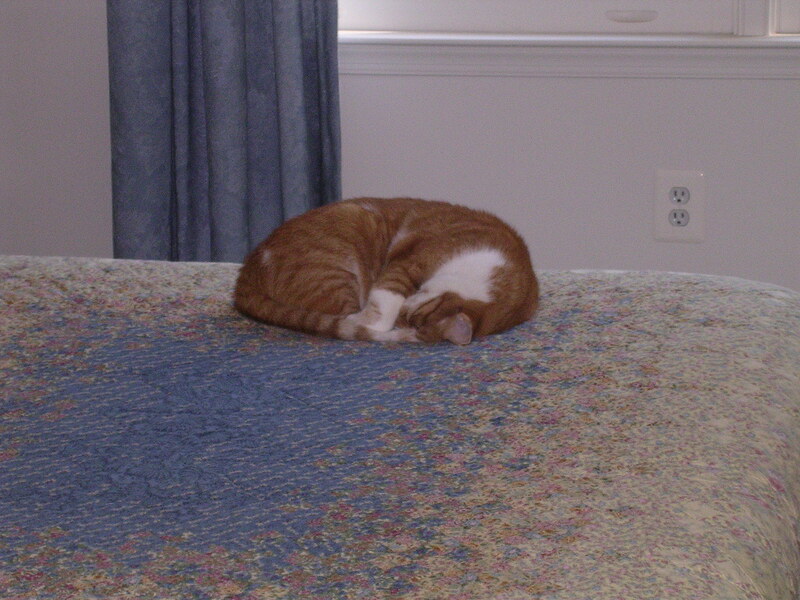 One of the favorite napping positions of a cat (so I hear) is this one…..curled up in a little ball – nose to tail – conserving body heat…..nice and neat and compact! Right? Mom said yesterday (much to my confusion) that I looked just like a PET ROCK she used to have many years ago. Pet rock? Huh? Apparently back a million years ago when she was young (tee hee) someone had a brilliant idea how to make a bunch of money by finding smooth round rocks and painting cats on them. Not just cats – other stuff too – but we cats often curl up in a ball to sleep and so we made a perfect “model” for these pet rocks. Last night on TV Mom and Dad were watching the international channel and the Japanese station was featuring (are you ready?) a family that lives in a mountainous area in Japan where there’s a lot of snow in the winter…..they live by a river…..and throughout the snowy days they all sit inside their house and paint cats on smooth river stones they’d collected the rest of the year. They sell them in stores and they are quite popular. How cool is that? They were really neat – very colorful and beautifully painted. Mom still has her pet rock from long ago. She says she hasn’t seen them in shops for many years but it sounds like a way FUN thing to do with a smooth stone don’t you think? Meanwhile, I guess I can continue to be her personal PET ROCK…..curled up in a ball in the sunshine, making her remember “the old days” which in turn always makes her smile REAL BIG. I’m sure ya’ll get tired of hearing me talk about my naps…..even though they are a HUGE part of my life (and getting moreso as I get older!) – but really, what’s more relaxing for humans OR their companions than knowing they can grab some “Zs” in safety and complete comfort? Hmm? Today’s going to be a lazy kind of day anyway. My parents are leaving me later this morning to drive out into the country to meet my Auntie Carol and her visiting daughter Barbara (from some place far away called California) for lunch. 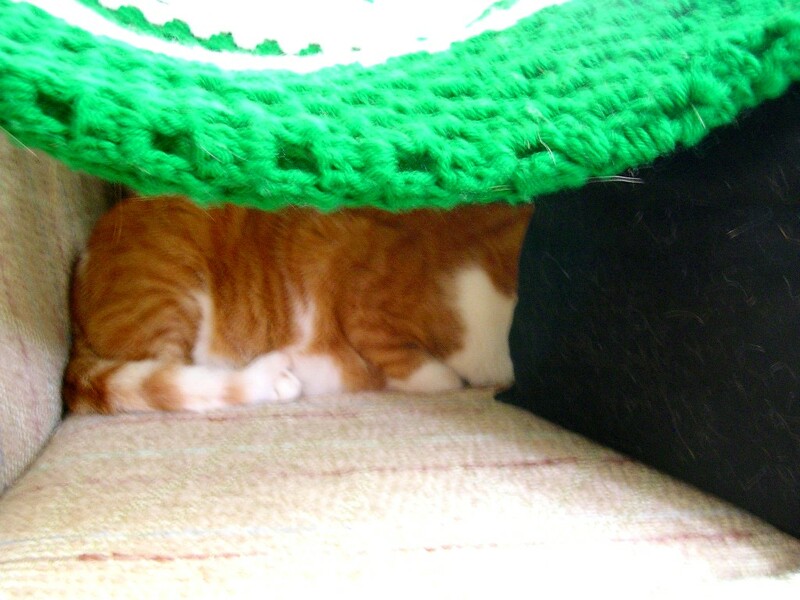 When my parents aren’t home, I just curl up somewhere – like their bed – and WAIT. 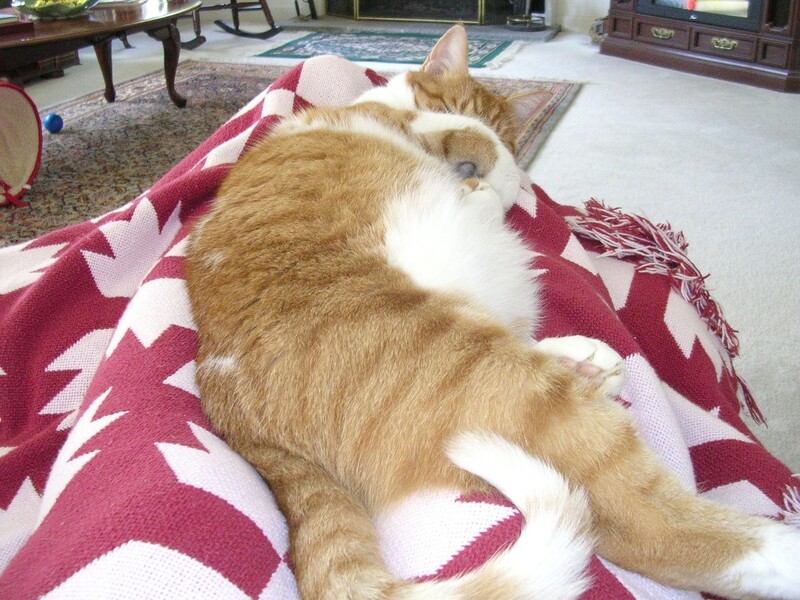 Waiting leads to napping of course….and my naps are usually pretty long (assuming the doorbell doesn’t ring) so by the time I’m ready to wake up – they will be home I’m sure. Then I’ll lay on the usual guilt trip for leaving me ALL ALONE….sniff…..with my meows of gratitude and cute faces when actually I’ve enjoyed the peace and quiet of having the house all to myself! So you guys know where I like to have MY naps around here – what’s YOUR favorite nap spot? Huh? 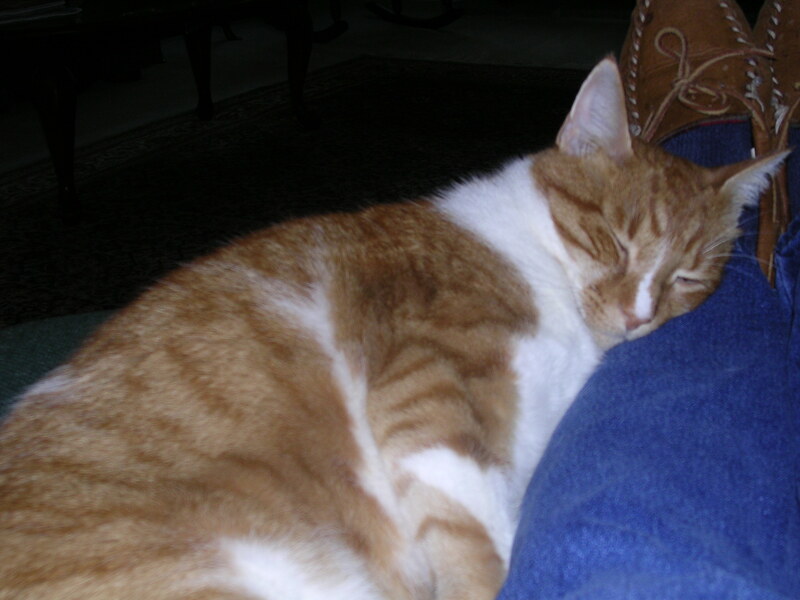 Maybe you’ll give me some new ideas for nap locations………….I’m always up for that!